Climate-KIC, one of the main initiatives of the European Union on innovation against climate change, seeks entrepreneurs at a conference on water man-agement at the Universitat Politècnica de València. 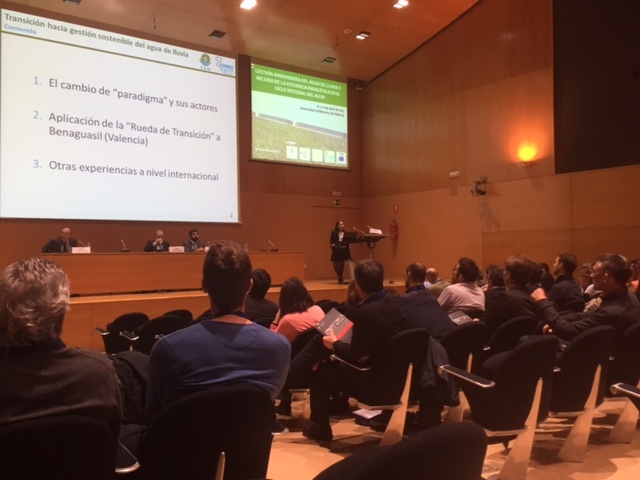 The conference on innovative rainwater management and improving energy efficiency in the integrated water cycle held at the Universitat Politècnica de València (UPV) have highlighted the relevance of climate change policies, one of the challenges of the XXI century. According to the United Nations (UN) in 2025 around 1,8 billion people will live in countries where there will be water shortages. Still according to the UN, by 2080 75 percent of Africa’s population could be at risk of hunger due to climate change. In this context of emergency against climate change several speakers at the conference exposed some progress on initiatives that improve energy efficiency in the complete cycle of rainwater. According to studies cited by Ignacio Andrés, UPV teacher, it is already possible to reduce up to 60% Co2 emissions and contribute to the improvement of the environment. One participant at the conference was Sara Perales, head of GreenBlue Management, a company specialized in water management. Perales, an engineer, explained E2stormed pro-ject, funded by the European Union and developed in Benaguasil, a town near Valencia. There, experts are working with the institutions and the public to raise awareness about the importance of treating water as a scarce resource and infrastructures have been undertaken. Actually, several Sustainable Drainage Systems (SUDS) have been made. The project objective is to promote water reuse, reduce energy consumption and decrease, in the long-term, the risk of flooding. Perales took part in 2012 in the PiP project (Pioneers into Practice), a program of Climate-KIC to attract experts and entrepreneurs to innovate in order to contribute to a more sustainable world. The PiP provides funding, training, counselling and placements in enterprises or institutions, national and international. The goal, according to José Luis Muñoz, responsible for Europe’s PiP programme is to promote “innovation to meet the challenges associated with climate change, through the creation not only of products and services, but of experts who understand the technological change that is occurring”. Muñoz explained the possibilities of PiP to the audience in his speech, social-technology innovation to meet the challenges of Climate Change. The PiP and other Climate –KIC programmes , as the business accelerator, Climate -KIC Accelerator, foster innovation and entrepreneurship in areas such as water efficiency , energy efficiency , smart grids and smart cities , sustainable transport and new materials and sustainable building technologies.